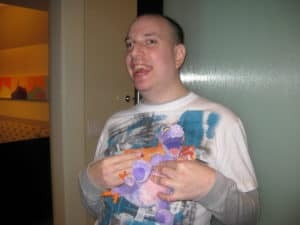 Brian Rubin’s son and Benjamin Rubin’s brother, Mitch, who has autism among other diagnosed special needs, lives in a group home in the northwest suburbs of Chicago. He works in the community with a job coach during the week. Mitch also works at Rubin Law on Mondays, shredding documents and greeting clients, among other assigned tasks.